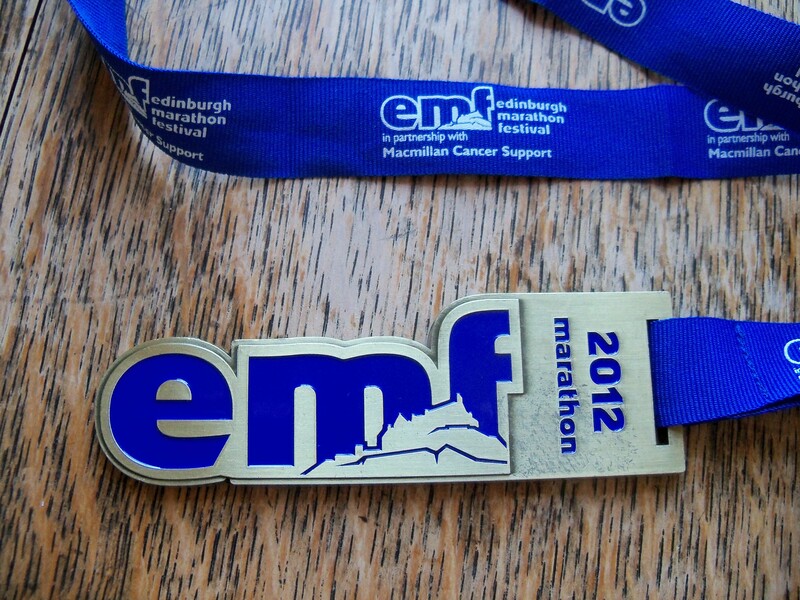 I’m writing this fresh (well, within reason) from the finish of the Edinburgh Marathon so I remember how I felt about the race. There’s bound to be a follow-up post looking at the splits, but I wanted to capture how I actually felt about the race before that starts to fade. The race starts on London Road, pretty close to the city centre and under the lovely Regent’s Park. We have been staying in Edinburgh a few hundred metres from the start line, so the build-up to the race was much more leisurely and relaxed than normal. In fact, having sauntered over to put my bag on the luggage lorry, I popped back to the flat to use the loo rather than join the hideous queue for the portaloo. The starting pens were fairly big, and fairly fluid. I wanted to make sure I wasn’t too close to the start to try to avoid going out too fast. However, after looking around and making a few judgments (not always easy with runners because it takes all sorts), I decided to move up a little closer to the start. At the same time as the marathon, and in the same pens, a marathon relay is run. I assumed that the relay runners at the red start would be giving it some and I didn’t want to get caught with someone cracking out a fast 10km. The race got underway (after a random robotic countdown) with the Black-eyed Peas. At first the start felt less congested than London, but with the twists of the first few miles and starting a bit further back, there were some familiar moments of slowing down and surging as gaps appeared. It wasn’t helped by the random appearance of a couple of waste skips (not skips so much, more industrial wheelie bins – do they have a name? – you know the ones I mean), which everyone had to weave around. I missed the first mile marker and didn’t hear my Garmin clock off the first lap, so started worrying I was going a bit slow. I was picking people off, and the pace felt about right, but I could see 7:30 on my watch and no sign of the first mile. I upped the pace a little, trying to take it easy on the hills, and mile 2 passed in something like 6:23. The next few miles passed with a few uphills, followed by predominantly downhill stretches as we headed towards the coast. I was seeing a few 6:30s flash up on my Garmin, which was doing a considerably better job at staying in-sync with the mile markers than it had in London. The six-mile marker passed, and I went over the 10km timing mat in something like 41 minutes. All good. Staying along the seafront, the seven-mile marker passed and it was time for my first gel. Rhubarb and custard, tasty and sat fairly well. Water stations were every three miles and the bottles didn’t have sports tops. From the start the heat was noticeable, so I’d decided that I needed to take on water regularly and hang on to it. It’s easy to spill normal-topped bottled water everywhere when you’re running, so I jammed my thumb in the top of the bottle, which seemed to do the trick. The coast around Edinburgh and Musselburgh is very pretty – and looked familiar from a previous year’s cycle tour. As we ran, there were pockets of support, making the atmosphere closer to Paris than London. The spectators we passed were great, though, and I found myself running with a guy who had his name on his shirt. Each time people shouted out ‘Go John’ he’d get a little bit faster. Note to spectators: cheering really does work. The Edinburgh Marathon marketing makes a great deal of the fact that it’s largely downhill, and flat once you get out of the city. The coastal route certainly wasn’t flat – although it wasn’t especially hilly – it was just the kind of slight uphill that hits you in your quads. I passed the 13.1-mile mat in 1:26 and a few seconds, feeling good and with the pack of runners thinning out substantially. At mile 14 I took my next gel – another rhubarb and custard – and pressed on. By this stage my splits were hovering around 6:40, but with the previous miles in the bank things were looking good. Somewhere around the 17-mile point the route started climbing. You head up a slight (but noticeable) hill for a mile or so before hitting a turnaround point and running a stretch through a country estate. A mist was blowing off the sea, giving a bit of respite from the blazing sunshine. I was overtaking a lot of people on the uphills, but runners were starting to thin out into packs of between two and six with large gaps between them. Each time I found myself with a gap ahead I decided to close it down so I wasn’t running on my own. Once out of the estate, which included a bit of a downhill stretch, we were back heading uphill. My quads were taking a pounding and the heat of the day was starting to tell. There’s very little shade on the course, so there’s nowhere to hide when the weather is hot. I hit 19 miles and focused on the two miles that stood between me and my next gel. The constant gradients had taken their toll and my quads were starting to burn. Things were holding together, though, and I tried to remind myself that running seven miles is easy. Eventually, the 21-mile marker rolled around and I took on the forest fruits gel a little faster than I should have. It eventually settled in my stomach, but it wasn’t feeling pretty for a little while. Although my breathing was easy, my quads and feet were really starting to ache. I wasn’t overtaking, and wasn’t really getting overtaken, but I knew I was slowing. I clocked a couple of 7-minute miles and changed my focus to slogging it through. Mile 23 is a tough one. Fatigued, 5km feels like a long way. I pulled alongside a guy who was having a hard time of it and called out some encouragement. ‘Come on, you can do this,’ I said. ‘I’m not sure I can,’ he said, and then promptly kept pace with me and pulled a little in front. The heat became oppressive; my quads were on fire. We passed runners who needed to stretch out cramps and the odd walker. Still, we kept pace, swapping the lead, working through the metres. Eventually the 25-mile marker passed. The crowds alongside the road grew thicker and more vocal. There were bracingly cold showers to run through. I lost all sense of distance, and ran faster in the hope that the 26-mile marker would miraculously appear. It didn’t, I slowed. Then the chap I’d been running with caught me up and I dug deep to keep on with him. Finally the 26-mile marker hoved into view. I was hurting, the other guy was hurting. ‘Just 0.2 of a mile left,’ I called to him. I dug deep as we hung a left and the finish line appeared. I pushed, I gurned, I shouted at myself, I pumped my arms doing a very shabby impression of the T2000. I passed the finish line as the commentator called out something about it being hot and perhaps don’t push it so hard. The guy I’d been running with finished seconds behind me. We shook hands and had a sweaty manly hug. We thanked each other for the support along the way. ‘I ran this last year and got 3:01. I wanted to get sub-3 this year if it killed me, and it nearly did.’ He said. I finished in 2:56:40 – so the other guy knocked out a convincingly sub-3 performance. Sure, I’m going to look at my splits at some point and fret over those slow final miles, but for today helping someone – and being helped myself – through to good sub-3 time is what it’s all about. The support from the spectators was great, but the camaraderie of the runners pushing through in tough conditions and encouraging others to give it their all was outstanding. From memory, the pens are pretty open to move between, so getting closer to the start shouldn’t be an issue. The first few miles through the city wind a bit, so early pacing can be a bit difficult to judge. However, the vast majority of the race at sub-3 pace will be fairly clear, so there’s plenty of opportunity to dictate your own race. Good luck with the race – it’s a great event!